A critical analysis of John Ford's The Quiet Man as myth, commodity and fetish, and the celebration of a film that has sustained considerable academic attention and popular appreciation since its release in 1952. In 1996, The Quiet Man topped an Irish Times poll for the best Irish film of all time. Almost ten years later, with many more Irish (and Irish-themed) films made, The Quiet Man still occupied number four in a poll of 10,000 people across Ireland. John Ford's greatest commercial success, the film also set a template for Ireland's representation, and promotion, for over half a century. This book, The Quiet Man ... and Beyond, involves both critical analysis of aspects of The Quiet Man as myth, commodity and fetish and the celebration of a film that has sustained considerable academic attention and popular appreciation since its release in 1952. 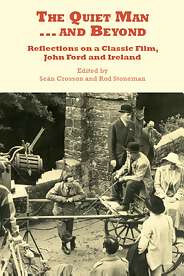 Among the topics considered are the complexity of the film's relation to Ireland, to Irish literature and to John Ford's other films; its perceived place with regard to indigenous Irish cinema; and the phenomenon of its circulation and reception as a cult film over the years. Contributors include Ruth Barton, James P. Byrne, Sean Crosson, Fidelma Farley, Roddy Flynn, Adrian Frazier, Luke Gibbons, Michael Patrick Gillespie, Conor Groome, John Hill, Des MacHale, Barry Monahan, Brian O'Conchubhair, Diog O'Connell, Caitriona O'Torna, Tom Paulus, Sean Ryder, Eamonn Slater and Rod Stoneman. Sean Crosson is a lecturer on Irish and world cinema with the Huston School of Film & Digital Media at NUI Galway, where he is Programme Coordinator of the MA in Film Studies. Rod Stoneman, formerly Chief Executive of Bord Scannan na heireann/The Irish Film Board, is the Director of the Huston School of Film & Digital Media at NUI Galway.